Take a look at most any household appliance, light bulb or even your mobile phone and you’ll likely see the UL (Underwriters Laboratories) mark—the single most accepted certification and safety standard for electrical devices in the United States. The iconic symbol appears on 22 billion products annually. Xue Wang ’10, ’14 (applied statistics, sustainability) is a project coordinator on the advisory team at UL’s Northbrook campus in Chicago. The 122-year-old company’s business unit helps manufacturers capture value for their sustainability efforts. “After learning there is a UL division working to advance global sustainability, environmental health and safety by supporting the growth and development of environmentally preferable products and services, I realized this is the place I want to be,” Wang said. Growing up in China, she witnessed the unfortunate toll that nearly 1.4 billion people took on a region’s environmental resources. “As a member of the post-’80s generation, I witnessed China’s rapidly developing economy and the environmental costs at the same time,” Wang said. She decided to explore environmentally friendly technologies after watching a documentary on e-waste recycling in Guiyu, China, where people burn wires and printed circuit boards to attain valuable metals such as gold and copper. After enrolling in the master’s program in applied statistics at RIT, Wang attended a seminar presented by Gabrielle Gaustad, an associate professor in the Golisano Institute for Sustainability (GIS). Wang recalled being riveted by Gaustad’s research into the implications of material scarcity and criticality on future clean energy technologies for which she received the Faculty Early Career Development (CAREER) Program Award from the National Science Foundation in 2015. At UL in Chicago, Wang conducts scientific studies and writes feasibility study reports while also developing UL Environmental Claim Validation protocols. She also keeps busy preparing proposals while helping ascertain a wide range of project data, including collecting, maintaining and analyzing sustainability metrics when it comes to the energy consumption of tested equipment. 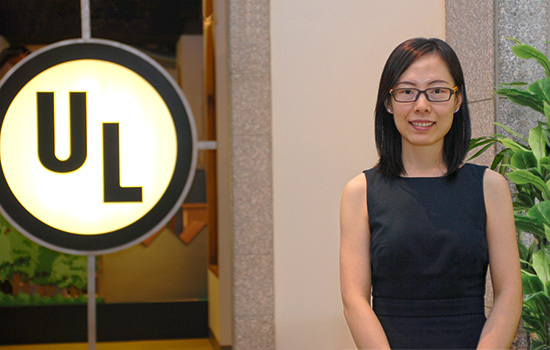 During her job interview at UL, Wang’s manager introduced her to several UL sustainability standards, including its benchmark for mobile phones. She said she’s confident that her rigorous GIS coursework prepared her for the strong foundation upon which she can build a successful career in the sustainability field. “My laboratory experience in lithium-ion battery recycling research enhanced my analytical skills and prepared me to be a critical thinker,” Wang said. Alumni follow various career paths, including corporate sustainability director, industrial research and development specialist, environmental policy analyst and university professor. They work for organizations such as Praxair Inc., MIT, U.S. Environmental Protection Agency, New York State Energy Research and Development Authority, Rochester Regional Health and Michigan State University.